Sic Bo is an ancient Chinese game which is becoming increasingly popular in online casinos these days. The names translates, somewhat confusingly, as “small big” or “hi lo”, as it allows for both big and small wagers to be made. It is a game which is played with three dice and while the rules are relatively simple it offers a fascinating way to earn some money. You may also know it by the name of Lucky Dice, and if you are thinking of playing some online games then you would be well advised to get a handle on the rules before you give it a go. Sic Bo Rules: How Does is Work? You will be presented with a table which will probably look a bit confusing to you at first. Using this table you can make your wagers in a number of different ways; small or big, on all three dice or on just one or two of them. You can also pick selected numbers or go for a combination. Once get a grasp on how the table layout works then you know all there is to know about the game. There are no hidden tricks or extra knowledge to either help or hinder your progress. It is simply a question of trying to work out what numbers will come out. To get started at Sic Bo you simply need to place your wager on the number or combination you expect will come up. You will then generally find a “roll” button on the screen which you need to click on. The three dice will then start rolling. They will normally be in a glass or metal cage type enclosure and in some casino sites the brilliant graphics make it look really life like. If you get a winning combination then this will light up straight away and you will get your pay out automatically. You can then start off with a new bet or stick to the same combination as the game which has just ended. This is done by clicking on either “clear” or “repeat”. You will find that the game is really quite similar in all of the online casino sites. What might change are the odds on offer, the graphics and the sound effects. Apart from that, you can go from one site to another without seeing a lot of difference. This makes Sic Bo an ideal game for anyone who likes to try out different sites instead of just settling on one. Despite the apparent simplicity of the game, over time you will realise that it is possible to work out some sort of system in order to make the type of wager which is most likely to earn you big money. 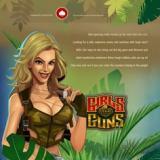 It is certainly one of the most enjoyable casino games around, so you should have fun getting used to it.